If you build it, they will remember. 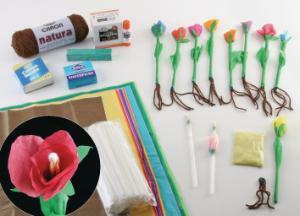 This hands-on construction activity leads students through building their own colorful models of beautiful flowering plants, which will reinforce the structure and function of each part. Students begin by using a KWL chart and then complete their own research of flowering plants, which includes labelling a diagram and completing a chart of functions. Finally, students follow a procedure with clear diagrams and templates for the leaves, petals and sepals, to assemble their own flowering plants, complete with pistils, stamens, ovaries, pollen, and more. These models can be kept in class or taken home. Developed by Christine Budnik. Kit is aligned to national standards and includes instructions, written assessment and answer key, and materials for 30 students. Grades 4–8.